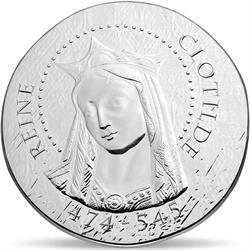 Home > religion > people & saints > 2016 France €10 Silver Proof Coin "Women of France: Queen Clotilde"
This is the inaugural issue in the series “Women of France” and is dedicated to Queen Clotilde (474-545). She is credited with establishing and spreading Christianity in France when she inspired her husband, King Clovis I, to convert to the Christian faith. For her efforts in helping to foster Christianity throughout France, the Catholic Church canonized Queen Clotilde in 550. Saint Clotilde is recognized by the Catholic Church as the patron saint of brides, adopted children, parents, exiles, and widows. 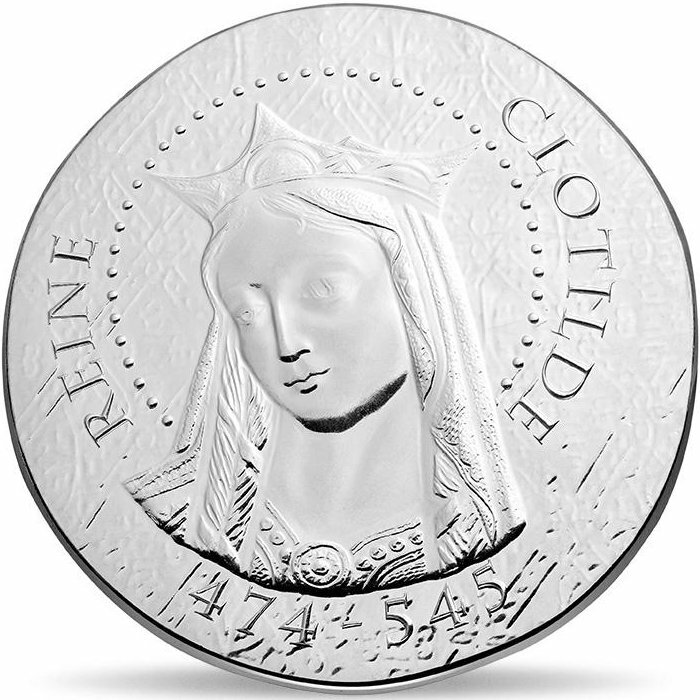 The obverse features a portrait of a crowned Queen Clotilde looking solemnly downward toward the left, an image reverential of her sainthood. A circle of light is depicted as 41 dots around her head. The background shows a lightly textured pattern bearing crosses, akin to tapestries of the era during which Queen Clotilde lived. The reverse depicts the baptism of King Clovis, who is seen prayerfully sitting within a baptismal font as Bishop Remigius delivers the baptismal rites and others look on. 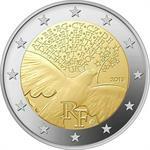 Inscribed at the top of the coin is 498 and REIMS, marking the year and location of King Clovis’ baptism. The background features a lightly textured diamond checkerboard finish roughly resembling the tapestry pattern on the obverse.